One way to cut the carbon footprint and boost public health is to get more people biking and walking. Read about how this is working out here and around the world. The mayor’s philosophy is simple: owning a car doesn’t give you the right to occupy the public space. So they got rid of them. Read how. 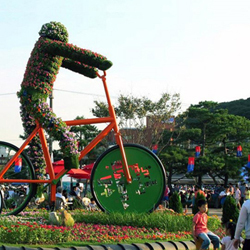 How Suwon went from car-dominated to a busing, biking, walking city. Read article. If there is no obvious route, a scheme like Whim’s might suggest a bicycle from the city’s bike-share scheme (if one is close to your front door), followed by a train and then a taxi; an on-demand bus (“hail” it on the app and it will come and pick you up); or a one-way car-share to a tram and a rented “e-bike” with a small electric motor to alleviate the strain of pedaling for the final leg. Once a route has been chosen it will make any bookings needed, as well as ensuring that hire vehicles are available and public-transport sections are running on time. Costs will be displayed for every option, making clear the trade-offs between speed, comfort and price. Customers will be able to buy one-off journeys or “bundles” modeled on mobile-phone contracts, allowing a certain amount of travel each month. Many countries have websites that give information on how to reach a destination by bus or train, both within cities and between them; in some places Google’s online maps have transport information built in. Buying tickets online is now common; Trainline, an online booking system for rail tickets, is rolling out across Europe. But after getting advice on their routes, travelers have always had to find their own way to a bus stop or train station, or call a cab. Payment and booking systems have generally been separate for each leg of a journey, and the “last mile” between mass transit and final destination has not been covered at all. Services such as Whim aim to change all this: removing the guesswork, combining the various options in the most efficient and cost-effective ways, and getting the traveller seamlessly from door to door. Without such new thinking, cities will grind towards gridlock. In 2007 half the world’s population lived in cities; by 2050 it is expected that two-thirds will. According to Arthur D. Little, a consultancy, urban journeys already account for nearly two-thirds of all distance travelled by people. On current trends urban distance travelled each year will have trebled by 2050, and the average time urban drivers spend languishing in traffic jams is set to double to 106 hours a year. The traditional policy responses to congestion—-build more roads and expand public transport—-are too expensive for these cash-strapped times. Hence the appeal to urban planners of the idea of travelers combining existing mass-transit schemes with a growing variety of private services. It offers a way to attract private capital into “public” transport. By enabling a closer link between supply and demand it will make mass transport more efficient. Congestion at peak hours will fall as travelers are diverted from crowded routes to less-packed ones; varying prices by time of day could help here, too. Public-health experts are also keen on the new approach. The apps through which the various options are accessed could be tweaked to encourage healthier choices, such as walking or cycling, if desired. Emissions of pollutants should also fall, because fewer vehicles would be idling in jams and there would be fewer cars on the street. Helsinki thinks it can make its center free of cars by 2025—not by banning them, but by building a transport system that renders them redundant. As well as commuters’ lives, cities will be transformed, too. With fewer cars and parking spaces needed, they can be redesigned to be more pedestrian-friendly and to have more green spaces. Quicker journeys will increase the catchment area for job-seekers prepared to travel to work. Won’t the arrival of self-driving cars render such thinking unnecessary? Not quickly, and even then, not really. Affordable driverless cars that can handle both city driving and motorways safely are a long way off. And even after they arrive, mass transit systems will often remain the best way to move large numbers of people swiftly. If all of the 1.3m daily commuters into central London switched to autonomous vehicles, it would become a giant parking lot. The better integrated a city’s transport system, the less demand there will be for driverless cars, and the easier those cars will be to combine with the other options. The new approach to transport as a service relies on two interconnected trends. The first is the spread of smartphones, which both generate the data required to manage a system that combines a wide variety of public and private transport options, and allow firms to offer the information via an app. They have already made navigating a city by public transport much easier. “Intelligent” journey planners, which use live information about congestion, disruption from accidents and the like to suggest the best route, are proliferating. Around 70% of Londoners regularly use an app such as Transport for London’s journey planner. Live travel information shows whether trains and buses are running on time. The second is the rise of the “sharing economy”, with businesses such as Airbnb making it possible to rent fixed assets such as apartments when they are not being used. Young urbanites, who have become accustomed to usership instead of ownership, find the notion of transport as a service both natural and appealing. Meanwhile the cost of running a car in a city goes ever upwards. Parking gets harder. Many city-dwellers are questioning whether the convenience is worth it. Between 1983 and 2014 the share of Americans aged 20-24 with a driving license fell from 92% to 77%. Ride-hailing services are the most obvious response to these two trends. Since Uber turned the ignition switch in 2008 it has expanded to operate in 500 cities around the world. Competitors such as Lyft, which also uses an app to match riders with drivers and to handle payments, are growing rapidly, too. Didi Chuxing, China’s biggest e-taxi service, has 300m users in 400 cities and towns. Uber and Lyft essentially provide a new way of calling a cab. But both firms also offer ride-share services that promise to make journeys cheaper and only slightly less convenient. UberPool, Lyft Line and specialist ride-share companies such as Via, which operates in Chicago, New York, and Washington DC, put passengers going in the same direction together in shared cars and lets them split the bill. Passengers are being pooled in larger vehicles, too. Firms such as Bridj are using the wealth of data they collect from users’ smartphones to model travel patterns, and thus to run on-demand minibuses in several American cities, including Boston, Kansas City, and Washington DC. Book a ride and the app will show pick-up and drop-off points close to your origin and destination, any walking required and the fare. “It’s the bus that catches you,” says the firm’s founder, Matthew George. At $2-6 a trip it is not much pricier than a regular bus, but a comfortable seat is guaranteed. Ford is testing an on-demand shuttle bus around its vast plant at Dearborn, near Detroit. Several universities around the world run similar services for students around campuses. Plenty of firms now have pools of shared company vehicles available on demand, instead of giving one to every eligible employee. Self-driving is not out of the picture entirely. Car-sharing schemes, which offer most of the benefits of owning a car, but at much lower cost, are revving up. Some allow cars to be rented by the hour or even minute. Vehicles may have to be returned to the point of hire; or schemes may allow one-way trips between designated parking spots. Boston Consulting Group reckons that the 5.8m people now signed up to car-sharing schemes worldwide could grow to 35m in the next five years. These firms expand the traditional car-rental business by allowing shorter rental periods and more convenient pick-up and drop-off. Peer-to-peer schemes such as Getaround and Turo in America, and CarUnity in Germany, take car-sharing one stage further. These enable owners to rent out their cars for short periods, thus sweating assets that would otherwise sit at the curb for as much as 95% of the time. Services that fill empty seats in cars and split the cost of gasoline by connecting drivers with prospective passengers are also growing fast. The biggest by some way is BlaBlaCar, a French firm with operations in more than 20 countries. It mainly connects big cities rather than operating within them, taking a fee for matching passengers and drivers going the same way. Other niche services are springing up. In America Carpool Kids and Voom are among a band of new services that let parents connect and share rides. Zum, in San Francisco, is aiming to co-ordinate transport for children and child care such as babysitting in a single, on-demand system. The various permutations of car-sharing, car-pooling and ride-hailing pose a big threat to vehicle manufacturers’ sales. Some are rattled enough to get in on the act. The global car market is worth $2.3 trillion a year, of which Ford gets 6%, says Mark Fields, the firm’s boss. The market for transport services is $5.4 trillion a year, he estimates, of which it gets near to nothing. That is starting to change. Many carmakers already manufacture small electric vehicles that would suit a sharing scheme as they are easy to maintain and can be charged when they are parked, saving users the need to stop and pay for fuel. Some are planning powered scooters and electric micro-cars, which could also be used as shared vehicles for short urban trips. And most are busily reinventing themselves as mobility providers. In January GM announced it was investing $500m in Lyft to help it understand new transport models. In May Volkswagen put $300m into Gett, an Israeli rival to Uber; Toyota invested an undisclosed sum in Uber around the same time. Some carmakers have launched services of their own. Daimler has started a car-sharing service, car2go, which offers point-to-point rentals charged by the minute, hour or day. Users arrange, via an app, to pick a car up where a previous customer left it. Ford’s GoDrive, which operates in parts of London, also offers rental by the minute, as does DriveNow, a competitor, which is owned by BMW and Sixt, a car-hire firm. The next step is to combine these disparate experiments. Helsinki is not the only place seeking to integrate public and private transport, and do better at getting passengers from A to B. Switzerland’s national rail company has teamed up with car- and bike-sharing firms. Several Canadian cities have a scheme incorporating public transport, bike-sharing, taxis and Communauto, a car-sharing service; Brussels runs a similar scheme. But these only provide discounts for combined subscriptions and some limited integration of booking, though not payments. In Hanover, Germany’s 13th-largest city, Hannovermobil goes a bit further by charging users for their month’s travel in a single monthly bill. Moovel, owned by Daimler, operates a countrywide service in Germany that also knits different transport together—but booking and ticketing are still handled separately. Joint Venture in Silicon Valley is experimenting with integrating shuttle buses with other mobility apps that whisk users from door to door. After a successful pilot in Gothenburg, UbiGo will launch in Sweden this year, combining public and private transport. But truly turning transport into a service, as Helsinki is aiming to do, is a Herculean task. It not only means integrating the booking, payment and operating systems of dozens of transport providers. It also means persuading private firms to take part in the first place. Public-transport operators can be forced to do so by national or municipal authorities. But private operators may balk at sharing data and real-time information on customers with a third party, even if they are promised confidentiality. And why would a ride-sharing or taxi firm want to sign up to a scheme that may direct customers to its rivals? In Helsinki, Sampo Hietanen, the boss of MaaS Global, has two answers. First, as the use of private cars declines many more people will use the firm’s app (and its competitors’), so taking part will mean getting access to an ever-growing pool of customers. Second, any firm that does not join will be left behind. And though the contractual negotiations are proving tricky, to some amazement nearly all Helsinki’s transport operators—even taxi drivers—seem willing to give it a go. Finland’s sense of shared national endeavor probably helps. More important is the determination of the municipal and national governments. Indeed, without city authorities’ active encouragement mobility as a service will not take off, says Catherine Kargas of Marcon, a Canadian consulting firm. Finland’s national government is doing its bit by rewriting legislation to bring the various laws covering different modes of transport into harmony. The transport minister, Anne Berner, cites regulations that treat hire vehicles with fewer than seven seats as taxis, whereas minibuses are covered by the same laws as full-sized buses. Entirely separate laws cover vehicles that shift parcels and vehicles that shift people. That places an unnecessary obstacle in the way of any firm that might like to do both. Putting an independent tech firm like MaaS Global rather than an existing transport operator in charge of the app has some big advantages. A tech firm may be more innovative and more willing to take risks than a big incumbent. The likes of Deutsche Bahn, which already has a system to integrate trains and car-sharing, might still be slow to let innovators break in, reckons Mr Hietanen. Independent operators would be happy to offer a large ready-made market of travelers to any firm able to extend its range of offerings, and might be more willing to support small firms with new ideas. Mr Hietanen certainly has big plans. The Whim app includes pay-as-you-go “multi-modal” packages that bundle monthly travel requirements at a single price. For perhaps €95 ($106) a month it might offer free city-wide public transport, 100km of local taxi use, 500km of car rental and 1,500km on national public transport. He thinks that aiming mobility services at city-dwellers is too limited, and wants to integrate regional and national trains—as well as rural services, where on-demand buses and ride-sharing could prove handier than scheduled buses, which often travel half-empty. Other mobility evangelists go further. Some are eyeing big cities in the developing world, even though these rarely have good public-transport networks. Could the 50,000 minibuses and 150,000 taxis in Mexico City, for example, be better deployed as part of a system that encouraged ride-sharing and on-demand re-routing? Others talk of interoperability across borders; a few even suggest roping in airlines. Who knows: one day a wily entrepreneur may add an on-demand mobile pub.